The Procter & Gamble Company (P&G), together with its subsidiaries, provides branded consumer goods products worldwide. The company operates in three global business units (GBU): Beauty, Health and Well-Being, and Household Care. Procter & Gamble is a dividend aristocrat as well as a component of the S&P 500 index. One of its most prominent investors includes the legendary Warren Buffett. Procter & Gamble has been increasing its dividends for the past 52 consecutive years. From the end of 1998 up until December 2008 this dividend growth stock has delivered an annual average total return of 3.10 % to its shareholders. 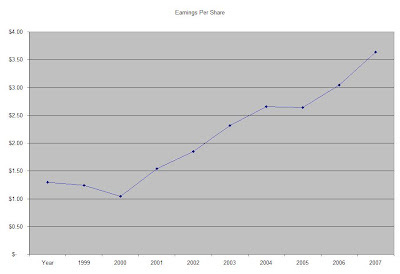 At the same time company has managed to deliver a 12.10% average annual increase in its EPS since 1999. The ROE has decreased from 35-45% range in early 2000s to 18% by 2008. The severe drop in ROE seems to be mainly an effect of the Gillette acquisition. Annual dividend payments have increased by an average of 10.90% annually over the past 10 years, which is lower than the growth in EPS. An 11% growth in dividends translates into the dividend payment doubling almost every six and a half years. If we look at historical data, going as far back as 1973, PG has actually managed to double its dividend payment every seven years on average. If we invested $100,000 in PG on December 31, 1998 we would have bought 2190 shares (Adjusted for a 2:1 stock split in 2004). In March 1999 your quarterly dividend income would have been $312. 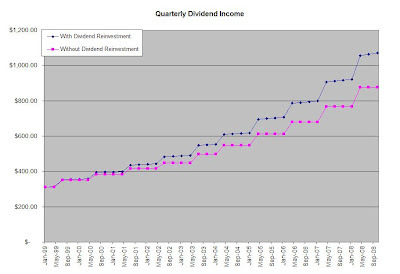 If you kept reinvesting the dividends though instead of spending them, your quarterly dividend income would have risen to $1069 by October 2008. For a period of 10 years, your quarterly dividend income would have increased 181%. If you reinvested it however, your quarterly dividend income would have increased over 243%. The dividend payout has remained below 50% for the majority of our study period, with the exception of a brief spike in 1999 and 2000. A lower payout is always a plus, since it leaves room for consistent dividend growth minimizing the impact of short-term fluctuations in earnings. I think that PG is attractively valued with its low price/earnings multiple of 15, a not too high DPR. However the current dividend yield is below the 3% minimum threshold that I have set. Two of PG’s competitors, JNJ and KMB both trade at P/E multiples of 13 times earnings. JNJ currently spots a 3.20% dividend yield, while KMB has a 4.40% yield. I would consider adding to my PG holdings on dips below $53.30.